If a chocolate assortment is what you're after, the Chocolatier's Special is for you. 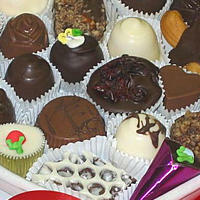 It's a handpicked selection of our handmade kosher chocolates. Our Research and Development team is always experimenting with new ingredients and techniques to create truly unique confections. We've put together some of our customers' favorites to create this fabulous assortment, including: craisin clusters, beehive bark, coconut crèmes, buttercrunch, dipped cashews, peanut butter cups, turtles, pb&j, caramel squares, truffles, fruit crèmes, cookies and cream bark, and more. Sizes: half pound ($22.00), one pound ($36.00) and two pound ($72.00) boxes available. Varieties: All Bittersweet (Pareve/non-dairy), All Milk & Assorted. Note that Assorted includes white chocolate also. Call for custom sizes and varieties.